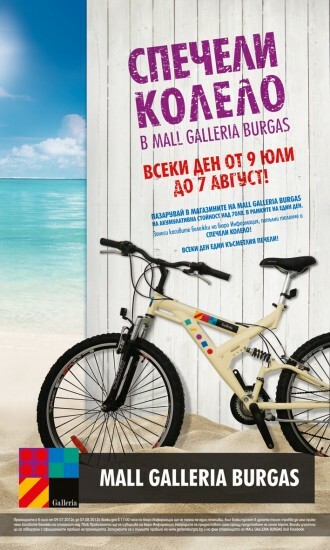 "Win a bicycle" is the new lottery mall Galleria Burgas started on July 9th. For one month every day a lucky one will leave the shopping and entertainment center with a new bike. The customers of mall Galleria Burgas that made purchases totaling 70 BGN within a day may participate in the lottery. The registration for inclusion in the campaign takes place at the Information Desk, upon presentation of the receipts proofing the purchases. Each participant fills a voucher, which is placed in a special pre-set for this purpose box. Again, the Info desk is the place where the prizes are being drawn - every day at 17 pm. The owners of the new bikes are personally invited by phone or email to receive their bicycles from the mall. With its exquisite shops that can satisfy the pretentions of each customer, mall Galleria Burgas offers great shopping opportunities. The mall promised to offer a new lifestyle and culture, a new way of trade and communication, and does it. It does not stop to surprise its customers too with a variety of raffles and games since its opening in May this year on. Hundreds of its visitors already had the chance to win various prizes. Now for its customers the largest trade and entertainment center on the South Sea coast has prepared 30 bicycles. The lottery takes place from July 9th to August 7th inclusive. To the ones winning, the organizers of the campaign remind that they have to receive their bicycles at the latest by August 15th. The conditions of the lottery are available online at www.galleriaburgas.bg and at the facebook page of mall Galleria Burgas (www.facebook.com/Galleria.Burgas) during the campaign.